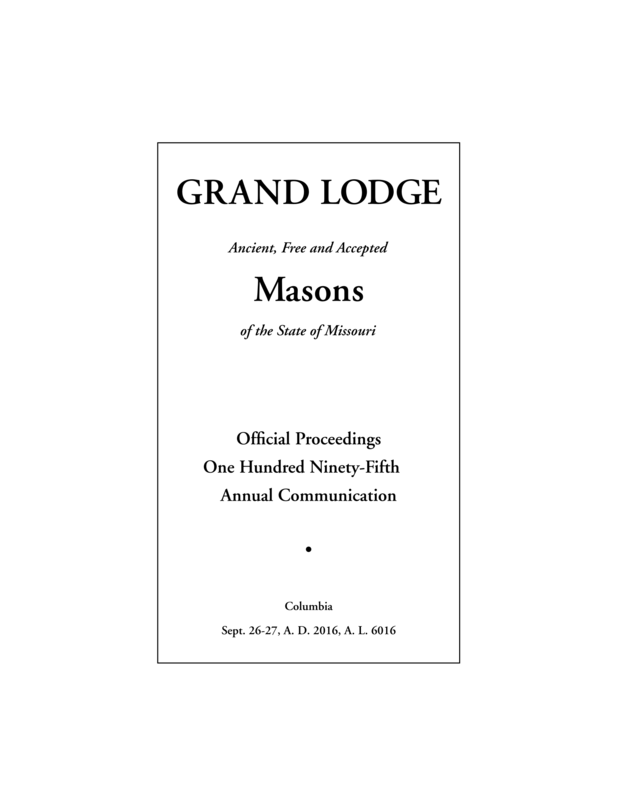 Thank you for the confidence and trust that you have bestowed upon me by electing me to the Office of Grand Master of the Grand Lodge of Ancient, Free and Accepted Masons of the State of Missouri. I am extremely humbled and fully conscious of my limitations in face of the great responsibility and of the many and varied duties of the office that I now hold. I do not have any new programs planned for the year, although with the assistance of the Education, Mentoring, Membership, and Public Relations committees I plan to revitalize existing programs such as Mentoring, the Online Education Program, and hopefully roll out a new PR campaign that will help educate the public about the wonderful benefits of being a Mason. I have also tasked a special committee with taking a hard look at redistricting to provide a more sensible approach to responding to the needs of the Lodges. Many districts are set up and working well, but there are few that need to be attended to due to population shifts and lodge closings and mergers. My message this year is WHAT COME YOU HERE TO DO? I hope that every brother in the state will reflect upon that question this year as they pass through the outer door into their lodge. 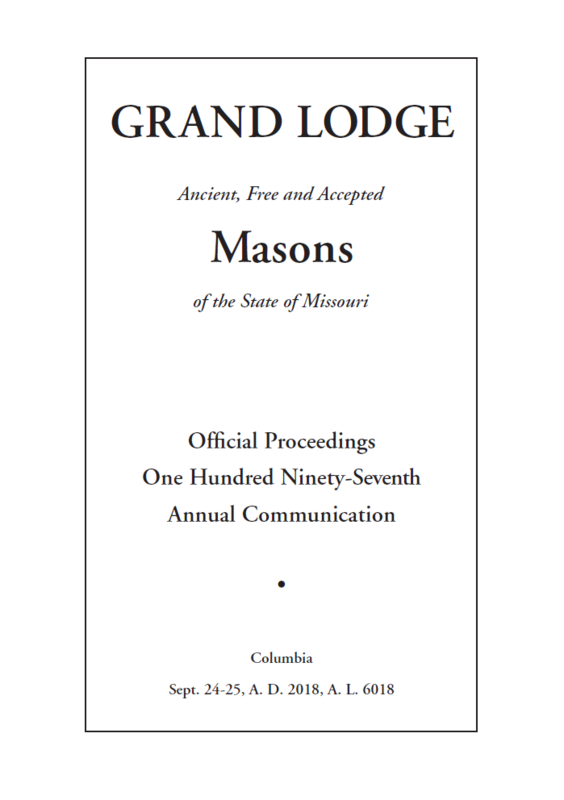 Have you ever paused to consider what your Masonic membership is worth to you, not in dollars, but in the things that dollars cannot buy? Was there ever an avenue into more wonderful friendships than that represented by your membership in Masonry? Has the thought occurred to you that when you extend your hand in fellowship and understanding, it is received not by one person, but by thousands? Have you ever thought of the privileges of service that Masonry offers and the happiness derived from such service and sacrifice? 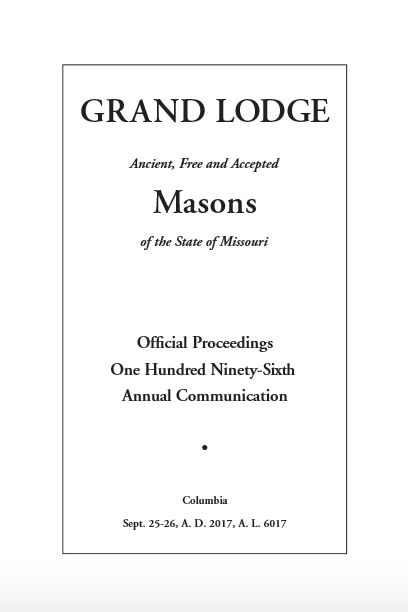 My Great Grandfather was raised to the sublime degree of Master Mason in 1873. There is a very good chance that if he had attended lodge when I was raised in 1993, it would have seemed very familiar except for his means of transportation and the presence of electricity. Sadly, in the last 25 years I have witnessed a shift in the way members conduct themselves in Lodge. Many of our long standing traditions and customs appear to be placed aside by some men that come to us with an agenda. 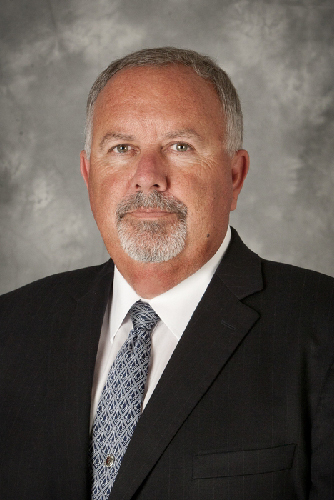 Instead of assimilating to our ancient customs, and rituals, they are using our sacred lodge halls as a place to settle scores from appendant body clubs, or other affiliated groups and gain leadership positions where they can advance their own agendas instead of doing the work that each of us promised and swore to do while kneeling at our altar. I understand that people are drawn to Freemasonry for many reasons. However, I hope the most important reason is that they are seeking a place where they can learn the ability to subdue their passions and improve themselves through our teachings. Brethren, do not overlook the normally sociable brother who is sitting away from the group with shoulders slumped and head hanging low. Break away from your clique, put your agenda aside, and help restore him from whatever trials he is facing through the tenets of friendship and brotherly love. We live in a troubled world that has lost the ability to engage in civil discourse. Unfortunately the same behavior is spilling over into our lodges. We must return civility to our lodges. Be strong. Live by your convictions. Live by your obligations as a Mason. Be civil and respectful to all. Let this be a year of reflection and renewal in our Lodges. This self-examination will remind us why we were chartered nearly 200 years ago, strengthen who we are today, and will guide us into our future. It is important to build a strong future by what we do today, while drawing on the incredible foundation built by those who came before us. It is that legacy that must be safeguarded.